My experience with New York Fries’ butter chicken poutine convinced me that Indian fusion can work in mysterious ways, so was it any surprise I was drawn to the new Butter Chicken Indian pizza at Panago? Butter chicken must be the most widely available Indian dish in Canada, the result of a perfect combination of accessible, familiar tastes combined with exotic spices. Even mainstream restaurant menus have discovered the dish, though one should never confuse easy availability with quality. Some restaurant-chain butter chicken is perfectly passable, but other places turn down the heat and tone down the flavour, leading to a description that should never be applied to Indian food: bland. I’ve got high hopes for this pizza. The Taste: Not spicy-hot at all. Just a nicely spiced mild butter chicken sauce with lots of thick, rich tomato flavour and Indian spices (cardamom, I think I love you). There’s nothing light about the sauce, which glistens with buttery fat. 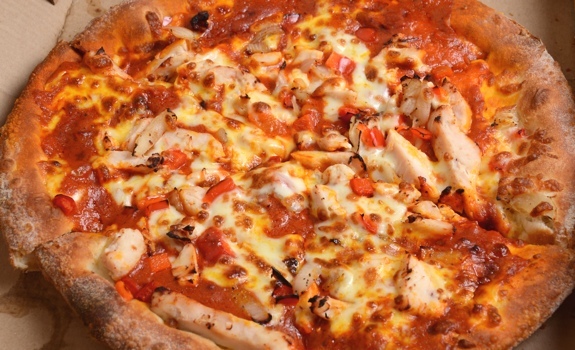 The other toppings – chicken, cheese, caramelized onions and red peppers – round everything out, but the sauce (generously applied, lucky me!) is front and centre. Yummers. 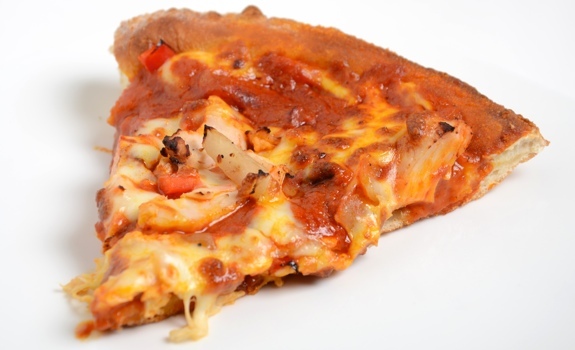 A slice of Panago Butter Chicken Indian pizza. Nutrition? : Couldn’t find any nutritional info on the Panago website. I’m guessing it’s because this pizza is still very new. The verdict: Very unique, and very good. I had already decided to try the Korma Pizza, as opposed to the Butter Chicken. I really enjoy Butter Chicken, my decision touches on the ‘Not spicy-hot at all’ heat issue. I noticed that the Korma comes with banana peppers…’hook, line & sinker!’;-) I have to get that bit of heat with my Indian spicing.